Valid at listed Mr Button stores and website. Click here to view the store near you. Mr Button is India's leading menswear fashion brand with it's major emphasis on the perfect fit. This is your one-stop solution for everything menswear style related. 2. Valid at listed Mr Button stores and website. Click here to view the store near you. 3. Valid for 3 months from the date of purchase. 4. Additionally, you will receive 4 Paytm Movie Vouchers worth Rs.250 each & 1 Paytm Flight Voucher worth Rs.1250 via email post purchasing this deal. 5. The voucher can be used only once per user. 7. The voucher can be used during the sale. 8. Any dispute related to the voucher should be referred to the issuing company and the decision of the issuing company shall be final. 9. The brand makes full efforts to accept Instant Deal vouchers but on account of any technical/administrative reasons, an outlet may refuse to accept the same. 10. You can write to us at wizards@mrbutton.in for any support you may require. 11. According to RBI's new guideline, users who have not undergone Paytm KYC will not receive cashback in their wallets. 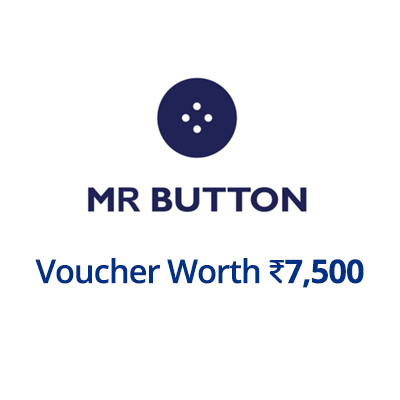 Visit the Mr Button store / website to redeem the value of the voucher. Share the voucher with the cashier at the time of payment or enter the code at the time of checkout on the website.